Navy Veteran William Dorsett holds a photograph during a portrait on Tuesday, May 23, 2017, in Brownsville, Texas. Dorsett served on the now decommissioned USS Independence, CV-62, which is expected to arrive at the Port of Brownsville for dismantling. 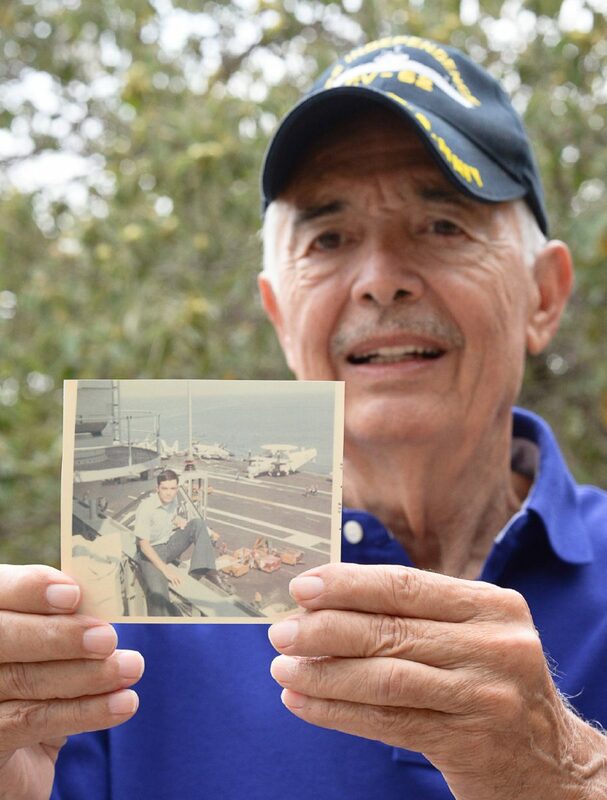 William Dorsett hasn’t seen the USS Independence since his three-year stint with the Navy came to an end in December 1970. The Rancho Viejo resident and Port Isabel native, who served aboard the Independence for three years and two Mediterranean tours, was excited by the prospect of seeing it again after all these years as it’s towed to the Port of Brownsville for scrapping. Originally the ship was supposed to be here in February or March, though its departure from the Puget Sound Naval Shipyard in Bremerton, Wash., was delayed. Because of a family commitment in Dallas, it looks like Dorsett won’t get to see the Independence come in after all. The latest estimate for its arrival is June 1. Friends have promised to take lots of photos, though, and he knows he’ll be able to see it from State Highway 48 where the road passes International Shipbreaking Ltd., part of the EMR Group, the company that will be dismantling the vessel under contract for the Navy. Dorsett completed boot camp in San Diego, Calif., and then was sent to Norfolk, Va., to report aboard ship. The years haven’t dimmed his memory of seeing the Independence for the first time. The teenager who’d grown up in Port Isabel and Brownsville had never seen anything so big in his life. “It’s awesome, walking up to the ship,” he said. Dorsett was a radar man, having studied electronics in the Navy, which led to a career in computer electronics after his military service. He likened the ship’s radar room, with its futuristic glowing consoles, to the bridge of the starship Enterprise. Dorsett’s Navy service took him to exotic ports of call in countries like Germany, Italy, Malta and Cuba. It was also dangerous and frightening at times — especially the botched landings. Dorsett said he witnessed two planes overshoot the runway and go over the side, a sight he describes as horrific. At least five pilots were lost during his time aboard the Independence, Dorsett said, noting that night flight operations were especially dicey. Dorsett said he wishes the Independence could have been saved and turned into a museum, though the carrier — commissioned in 1959 and decommissioned in 1998 — was stripped heavily after being mothballed to support the Navy’s active carrier fleet. Dorsett said he learned discipline while in the Navy, which served him well since he went back to college after he got out, earning a master’s degree in business from St. John’s University. His Navy training also prepared him for many types of jobs in the electronics industry, he said. But most important, perhaps, are the friends he made.